Wouldn’t you like an easier way to get weeknight dinners on the table? 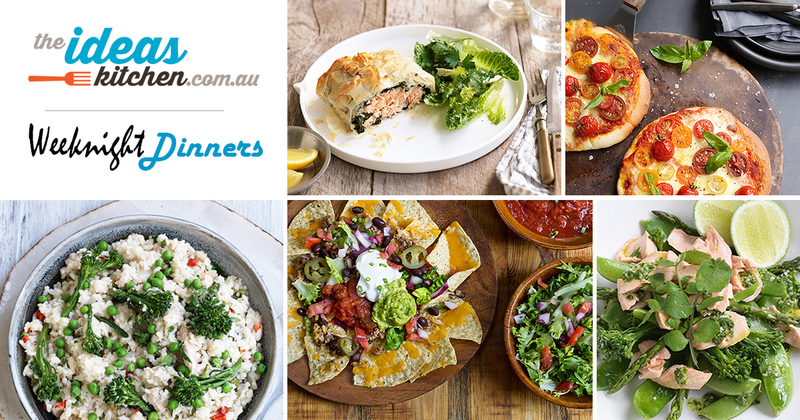 Check out our Monday to Friday meal plan, filled with healthy and delicious dinner recipes you can put together using your microwave and rice cooker. Our favourite is the ‘set and forget’ 30-minute Spring Chicken and Vegetable Risotto! So much flavour and aroma is packed into this healthy dish of steamed Thai fish, with zesty citrus notes, garlic, chilli and coriander all taking a starring role. The tender trout fillets will carry the seasoning beautifully and by cooking the fish with the steam mode of a Panasonic combination microwave, you will preserve all the wholesome nutritional benefits as well. A Panasonic rice cooker takes the hard labour out of risotto. We absolutely love coming up with new ways to use our kitchen appliances and we’ve definitely hit a winner with this chicken and vegie risotto. Instead of standing at the stove to slowly stir one ladle full of stock into the risotto at a time, you can use a Panasonic rice cooker and turn out perfect risotto in about thirty minutes. Dinner is all wrapped up with salmon and spinach filo parcels. If you are looking for a fancy dish without the fuss, our salmon and spinach filo parcels look extravagant but are very easy to master using your Panasonic convection microwave. With a ten minute prep time and only twenty minutes to cook, these fabulous little parcels make an effortless meal. A simple nachos dish you can whip up in a microwave. Ever the crowd pleaser, nachos liven up weeknight meals and never go astray when guests come to play. We’ve put together a super simple Nachos Supreme recipe for your microwave that can be on the table in a flash. Popular legend has it that the Margherita Pizza was created in honour of Queen Margherita by Pizzeria Brandi chef, Raffaele Esposito and his wife in 1889 using colours of the Italian flag; red (tomato), white (mozzarella) and green (basil). However, true Italophiles will tell you that the recipe stretches back even further in history. Whatever the case, this classic pizza is a must-have in your repertoire and it’s easy to create using a Panasonic bread maker and convection microwave oven. Check out the full range of Panasonic kitchen appliances.